Recently a few of my teammates and our wives, along with our chaplain, had the chance to go to a Hillsong concert in downtown Boston. It was an awesome experience! Even though I had already listened to their new album at least a million times, nothing compared with seeing it all live. This was my first real Christian concert and I loved it! I had been to many concerts before, I had gone to a Christian high school where there was chapel every day, and I have seen Christian bands perform at conferences, but I had never experienced something like this before. When my friend, Trey Burton, told me I would love it and immediately want to go to every concert of theirs afterward, he was right. It’s easy to think like Elijah did in the Bible, when he assumed he was the only one seeking after God. When you get into the routine of life, it sometimes may seem like you are alone — like you and your family are the only ones pursuing Christ. But then you get on a team where you meet other guys who are hungry for Christ, you get plugged into a local church and everyone’s seeking God. But the moment I heard every person at this concert singing their hearts out to God, I felt like I was experiencing what Heaven would one day be like. At times I would stop singing just to look around on the floor and up into the rafters to hear hearts being poured out to God and hands lifted high to Him. One of the coolest things that night was what happened after the concert. We were able to go backstage and meet the team and a few of the pastors. Often you hear people say you never want to meet your heroes because that’s when you realize they’re jerks or they’ll treat you as inferior to themselves, but that couldn’t have been further from the truth with this team. When we went backstage, we found the girls with the hair tied back, guys with the sleeves rolled up, eating plates of chicken, rice and broccoli. These performers who are the best of the best, touring the world, going through the same rigors as anyone else in showbusiness, did not demand the finest Boston had to offer. They were simply grateful for whatever they were offered. Seeing this type of humble joy and servant-heartedness was very encouraging. In my profession, everyone wants to be lifted up. 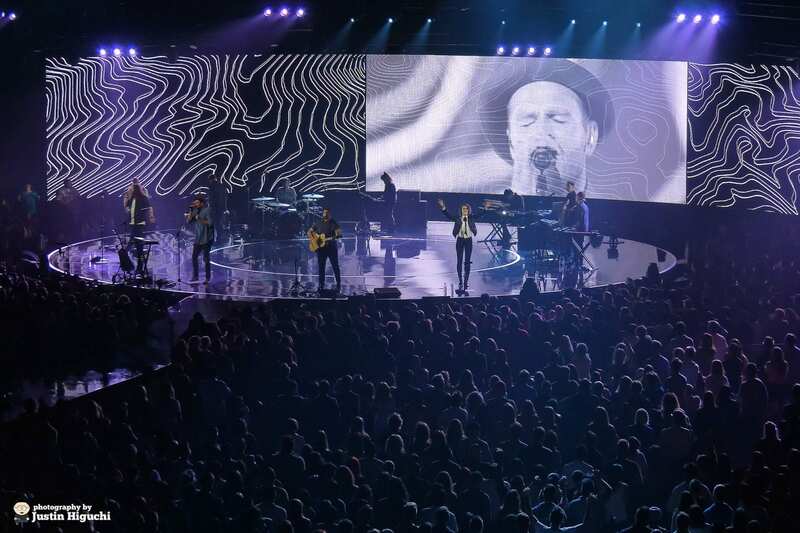 How do we take an example from a team like Hillsong and take a stand to not feed into that? We’re just like anyone else. We’re all made in the image of God and loved by Him as His children. This scene was the most impressive one of the night for me. Each person on the stage that night was using their God-given gifts to glorify Him. They are authentically being who God called them to be. In Hollywood and in the sports industry, the hardest thing for people is the constant battle between being who people want you to be and being who you know God wants you to be. Many will want you to put on a certain display on the field, act a specific way, or use a specific type of language, but once we fall into that temptation, we are operating outside of how God wants us to use our platform. Yet, there are many in these industries who are using their God-given gifts with authenticity to whom God’s called them to be. We don’t have to act or talk in such a way that is different from how we would behave at home or at church. We can be consistent. It’s a challenge every day to take this stance in an NFL locker room — to not conform to the way of others and instead stand firm in God’s will for my life — but every time I do, I experience the peace and joy of Christ. It’s then that He makes my life more real, more authentic and more fulfilling.